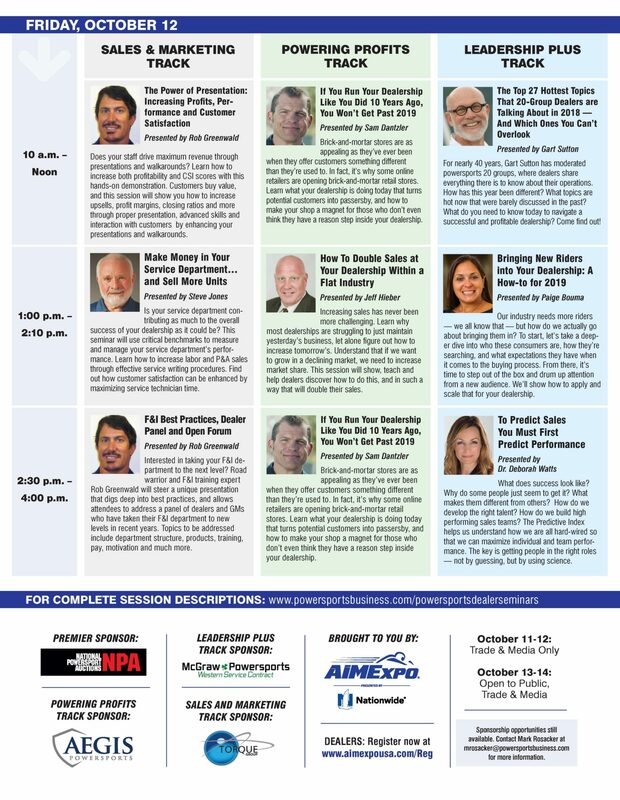 The schedule of tracks, seminars and speakers for the 2018 Powersports DEALER Seminars @ AIMExpo is below. 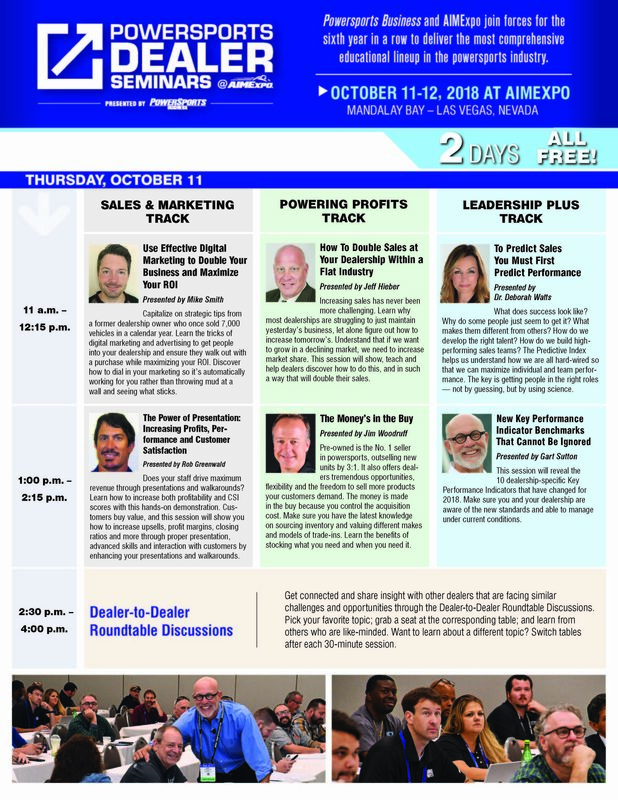 Sponsored by National Powersport Auctions, the Powersports DEALER Seminars @ AIMExpo will be held October 11-12 at Mandalay Bay during AIMExpo dealer days. Click on the image for a larger view of the 2018 schedule; download a PDF of the 2018 schedule here. Thanks to the Powersports DEALER Seminars @ AIMExpo presented by Powersports Business, dealer attendees of the industry’s groundbreaking trade show once again will have exclusive access to a valuable lineup of presentations designed to bolster dealership profitability and operations. 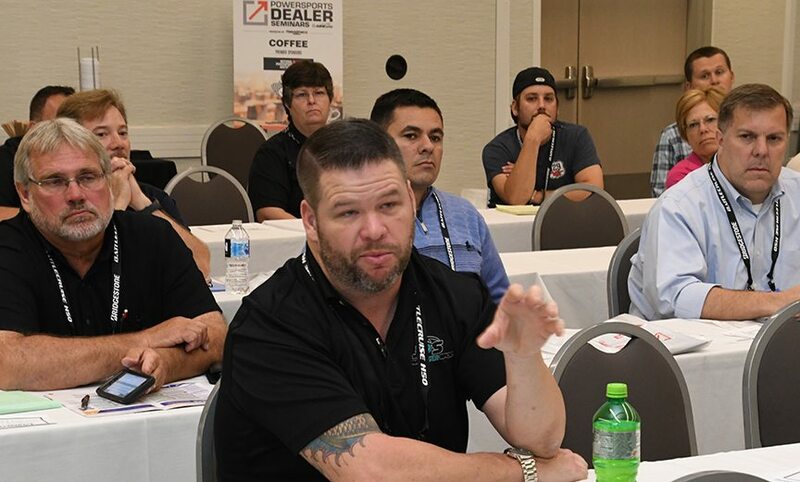 Dealer training is a significant part of AIMExpo presented by Nationwide, and with the Powersports DEALER Seminars @ AIMExpo, you’ll come away energized with new ideas provided by leading thinkers from within the industry. The education program at AIMExpo is managed by the staff of leading industry trade publication Powersports Business. Now in its sixth year, the Powersports DEALER Seminars @ AIMExpo have attracted thousands of dealers and industry professionals who have benefitted from the curriculum. Learn from a host of highly regarded speakers in the Sales and Marketing Track sponsored by the Torque Group; the Powering Profits Track sponsored by Aegis Powersports; and the Leadership Plus Track sponsored by McGraw Powersports Western Service Contract. 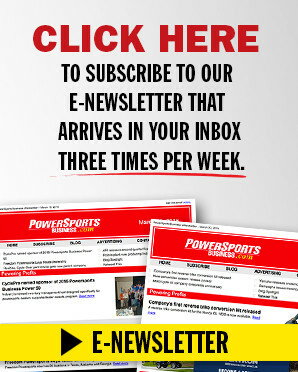 The 6th annual Powersports DEALER Seminars @ AIMExpo presented by Powersports Business still have several sponsorship opportunities available at the premier level. 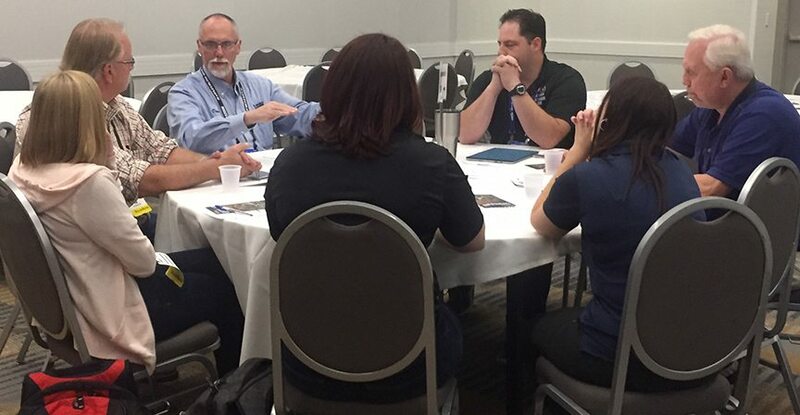 The classroom-style training sessions will be held October 11-12, 2018, at Mandalay Bay in Las Vegas, Nevada. 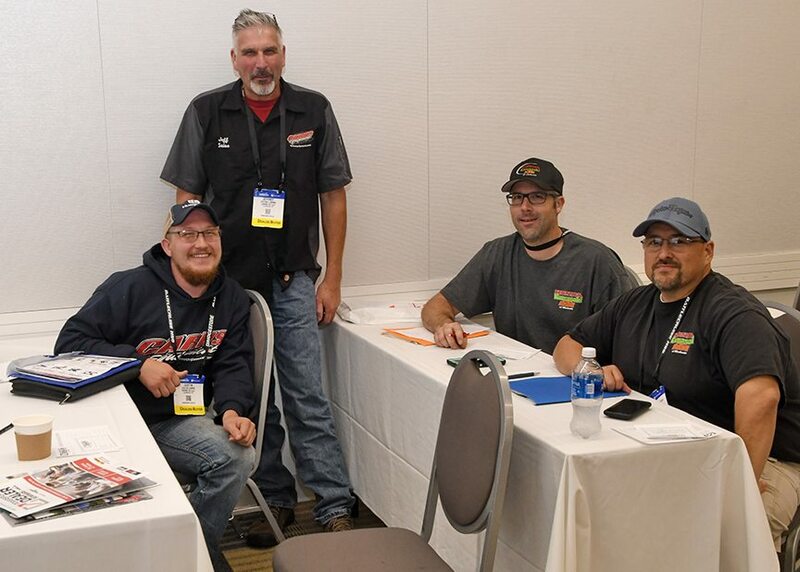 The dealer training sessions are October 11-12 only, with the AIMExpo show floor and demo area open from October 11-14. AIMExpo presented by Nationwide is the powersports industry’s only combined trade, media and consumer event in North America.